I aimed for the Odin level of this challenge which required me to read 11-20 books during the year but I ended up at the Valhalla level of 20+ books (23 and a half if I’m scrupulous). Many of these are great books, as can be seen from the high number of red stars (which indicates rated 3 or above) but if forced to pick a favourite I’d probably pick BOX 21. Or UNTIL THY WRATH BE PAST. Or THE QUARRY. I didn’t notice until writing up this wrap up that so many of the books were set in Sweden, next year I’ll try to expand to other countries in the region. Thanks to Zee from Notes from the North for hosting the challenge, sorry I dropped the ball on linking my review posts (one of the reasons I’m reducing my challenge participation next year) but I did enjoy the reading. That’s a great list. I’ve read about six of those, some not recently. I’m now looking for good books, as I just read Until Thy Wrath Be Past, Outrage and The Boy in the Suitcase in a row, so have high expectations for my next reads. So, will be checking this list. Hope for more great reads in 2012, including from Scandinavia, of course. Bernadette well done! 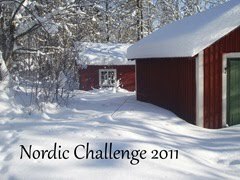 I didn’t join any challenges this year, but it is easy to find yourself having read ten Swedish books with out even trying. Like you I’ve read all these books (though not necessarily all this year) and enjoyed most of them. I, too, find a preponderance of Swedish novels among the Nordic available – more are being translated from Sweden than the other countries which I suppose is not surprising when you look at the relative size of its population cf Norway, Iceland, Denmark (& Finland if you are counting that as Nordic – which I think it is, but not Scandinavian?). I’d find it very hard to pick even three top reads out of this lot! Well I’ve only read four of them, so have some catching up to do! Bernadette – Well done you! The ones you’ve starred are all excellent reads (well, the ones I’ve read), and I’m glad you enjoyed them too. I am in absolute awe of your challenge completion, too.